RVs come in many shapes and sizes. Whether your treks are made in a travel trailer, a truck camper, or a large motor coach, there is likely the need for storage when you are not travelling. 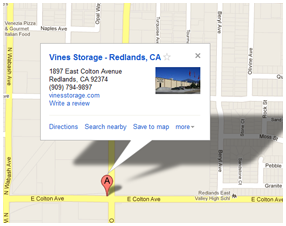 Residents in the Redlands area consider Vines Storage for the protection of their investment for several reasons. Off-site storage of an RV of any size makes sense in this day and age when families have at least two vehicles and may also need garage space for personal storage. Whatever the size of your RV or the duration for which you need storage, we have packages designed to meet your needs. Most RV vehicles are used only occasionally. Even if your RV is in regular use for several months of the year, there are specific benefits to securing storage away from home. Storing an RV in the driveway or in front of the home leaves it susceptible to theft or damage. The size of your RV may also create challenges in pulling in and out of your driveway or in achieving convenient parking for your family's vehicles. With off-site storage, your parking situation at home remains more open and convenient. Where security is concerned, it may seem as though your RV is safe in front of your home. We all know, however, that vehicles parked outdoors can be vandalized or stolen. Outdoor parking also leaves vehicles susceptible to damage from sun, wind, and rain. At Vines Storage in Redlands, customers may choose from indoor or outdoor parking for their vehicles, all of which are in a secured location that is monitored twenty-four hours a day, seven days a week. Maintaining a recreational vehicle such as a motor home requires more than parking during times of non-use. After trips, there are certain tasks such as dumping waste that must be completed. Vines Storage is a facility at which the necessities are available. When you store your RV with us, you have access to amenities, and to your vehicle, to perform pre- and post-trip maintenance as needed. We're happy to answer questions regarding RV storage. Contact us today for details.